Being part of our county's Master Gardener Speakers Guild has been a lot of fun. My program is titled "Herbs: A Place to Begin". It is for anyone who might be curious about growing herbs or is just beginning to use them. I give simple advice for ways to incorporate tasty herbs into your every day life. After such a sweet reception to my presentation, I've been adding regular posts about herbs. Watch for the ones titled "A Place to Begin" and check out my blog page Herbs. but recently discovered a new, easier way to make it from my fresh herbs. Bonus! It doesn't heat up my kitchen during these high summertime temperatures! I filled a jar with clean Lemon Balm leaves and a few lemon slices. I really pressed a bunch of leaves in there. Then I used the hot water feature on our Keurig machine. (I know, right?! 'Feeling pretty genius here!) 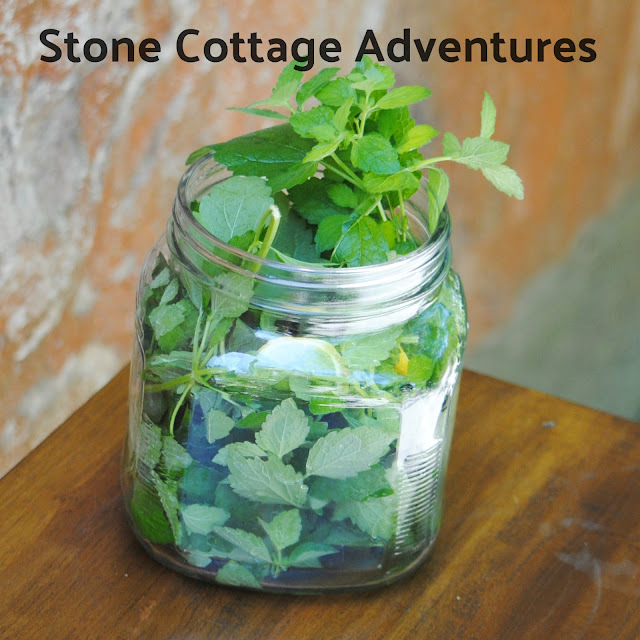 Once the jar of Lemon Balm was filled with hot water, I spun a lid on top and let it steep for about 15 minutes. Next I strained off all the wilted leaves and lemon slices and had a lovely glass of Lemon Balm Tea! 'Easy as filling a jar with leaves! I love this! I have been pulling the lemon balm out of my garden like weeds because it likes to take over. I love the scent of it. Never thought to make tea. Great idea! Gotta try this! We have lemon balm going wild all over our property! I love the stuff - pinned and printed! Thanks for Sharing at the What's for Dinner Party! Thanks for sharing at the What's for Dinner party!! You were in the top four most visited posts and will be featured at tomorrow's party!! Yahoo for you. Congrats on being featured at the Happiness is Homemade Blog party Marci! Great way to make tea (I'll pin and re-share it). If you get a chance, check out my post at https://www.colors4health.com/2018/07/beauty-healing-from-red-rocks-of-sedona.html and get social with me. Lemon Balm tea sounds delicious! I have one flower pot filled with lemon balm and up to now all I have been using it for was to flavor fish.